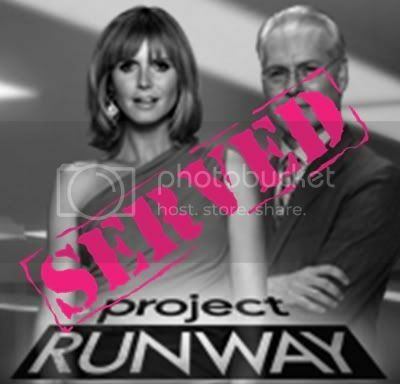 SERVED: Project Runway hasn't been the same since it moved to Lifetime. For starters, the show has been churned out season after season, taking away from the exclusivity of it. Season 8, which started this past Thursday, is the 2nd season this year. Give us some breathing room! But that's not the only reason why I'm SERVING Project Runway. When a show is on it's last legs, you need to change up some things. Maybe a new judge, different challenges... you don't add another 30 minutes to the episode! This season, ever PR episode will be expanded to 90 minutes. Give me a break here. Let's be honest, if it weren't for this blog and you fans who express your enjoyment of the PR recaps, I would quit. The talent is mediocre, too many contestants get to go to Bryant Park, and quite frankly I just find them boring. The past 2 seasons, I've even fast forwarded through the 60 minutes episode. Instead of a concise, well-edited episode, the show is bloated to include more filler that isn't that interesting (The Biggest Loser, this means you too). Project Runway, if your viewership is declining, don't make the rest of your viewers suffer with additional time wasted on a show we're only moderately interested in. SERVED! It really is a little sad - although I have to admit I always get hooked. I always try to give PRun the benefit of the doubt which sometimes pays off (Seth Aaron and Anthony from S7) and sometimes doesn't (All of S6). And Mr. "I turned around a kimono to make my model look like a chic monk and then stapled her to death and by the way I wear a hat to intimidate people" should have clearly been gone, not the girl who at least tried to not create something horrendous and unfinished. Yet still, I love the show...! I can't stand the show since it has moved to Lifetime. I used to love it when it was on Bravo - Although the creators hated the meddling, it's clear Bravo had better quality control.